Join the King County Bar Association at the Annual Luncheon in January! In November 2013, Dr. Vivian was honored for his vision and leadership in the fight for justice when he was awarded this Nation’s highest civilian honor—The Presidential Medal of Freedom. Among his many leadership roles, he has served on the board of the Center for Democratic Renewal and the National Voting Rights Museum. He currently serves as a founding Board Member of Capital City Bank, a Blackowned bank in Atlanta, and is also Board Chair of BASIC Diversity, Inc., the Nation’s oldest diversity consulting firm. He has provided civil rights counsel to Presidents Johnson, Carter, Reagan, Clinton, and Obama, and he continues to lecture on racial justice and democracy throughout the world. The New School for Social Research named Dr. C.T. Vivian “… spiritual leader, apostle of social justice, strategist of the civil rights movement … For decades he has been in the vanguard of the struggle for racial equality in America,” as they presented him with one of his many honorary doctorates. Dr. Vivian, once known as a Christian journalist, is best known for his work with Dr. Martin Luther King, Jr. As National Director of Affiliates, and strategist for every Southern Christian Leadership Conference (S.C.L.C.) organization, he truly helped change the nation. In Birmingham, his work helped to enact the Civil Rights Bill, and in Selma, the Voting Rights Bill. Vivian was deeply involved in other civil rights movements in Nashville, TN; Danville, VA; St. Augustine, FL; and Chicago, IL. Dr. Vivian won his first non-violent direct action movement in 1947 by integrating restaurants in Peoria, IL. The summer following the Selma Movement, Dr. Vivian developed, organized, and launched Vision, an educational program that provided over 700 Alabama students with college scholarships. Vision would later be known as Upward Bound. In 1970 Vivian authored the first book written by a member of Dr. King’s staff entitled Black Power and the American Myth. He is featured throughout PBS’s acclaimed documentary Eyes On The Prize (1987 & 2006). PBS later produced a full-length presentation, The Healing Ministry of the Rev. Dr. C.T. Vivian. He is also featured as both an activist and analyst in the series, The People’s Century (PBS/WGBH, 1998), and in the Tom Brokaw documentary King (History Channel, 2008). After leaving Dr. King’s Executive Staff, Dr. Vivian trained ministers and developed the urban curriculum for seminaries throughout the nation at the Urban Training Center in Chicago. He returned to the realm of seminary education as the Dean of Divinity at Shaw University Seminary. There he originated and acquired funding for an unprecedented national-wide program, the basis of his doctoral work, Seminary Without Walls. In 2008, Dr. Vivian founded the C.T. Vivian Leadership Institute, Inc., based in Atlanta, Georgia, to create a model leadership culture for the purpose of training and educating the new generation of grass-roots leaders. More recently, Dr. Vivian received an Honorary Doctorate from Morehouse College (2010), served as National President of S.C.L.C. (2012), and currently serves as Dean of The Urban Institute at The Interdenominational Theological Center in Atlanta, Georgia. The Washington Young Lawyers Committee (WYLC) is pleased to invite law students from the University of Washington and Seattle University to attend the popular Washington State Bar Association (WSBA) Open Sections Night to be held in Seattle, Washington on January 21. Open Sections Night connects new and young lawyers to WSBA Sections, which offer a wealth of experience and resources to help new and young lawyers find their footing in the legal profession. Please help us spread the word by sharing this event and our attached flier with faculty and law students at your respective university. The Trina Grillo Retreat provides a unique opportunity for public interest and social justice-oriented law students, faculty, and practitioners to forge an alliance by exchanging viewpoints, exploring career opportunities, and formulating strategies for social justice. Room rates are set at $92.94 (tax & fees included) for March 5th only. Rate available through February 1, 2016 (depending on room availability). 2016 NASCAR Weekend and Rugby 7s are the same weekend as the Retreat, so be sure to book your room early. 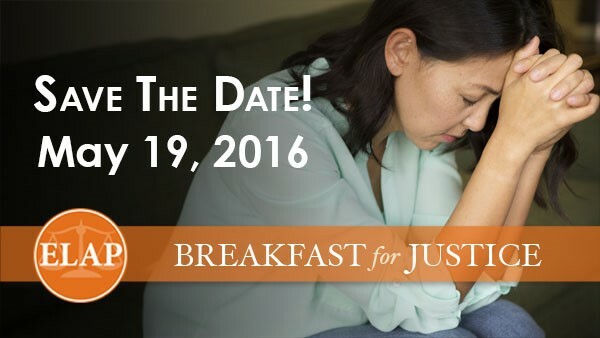 We invite you to join our distinguished host committee on Thursday, May 19, 2016, for the 6th Annual ELAP Breakfast for Justice and help support legal services for low-income families and survivors of domestic violence. In his keynote address, James Bamberger, will present the recent findings about the increased “Justice Gap” impacting low-income residents of Washington State. The updated Civil Legal Needs Study reveals that the need for securing equal access to justice is greater than ever. You won’t want to miss this compelling speech. ← Interested in Expanding Your Knowledge of Family Law? Apply to Intern with ELAP Winter Quarter!